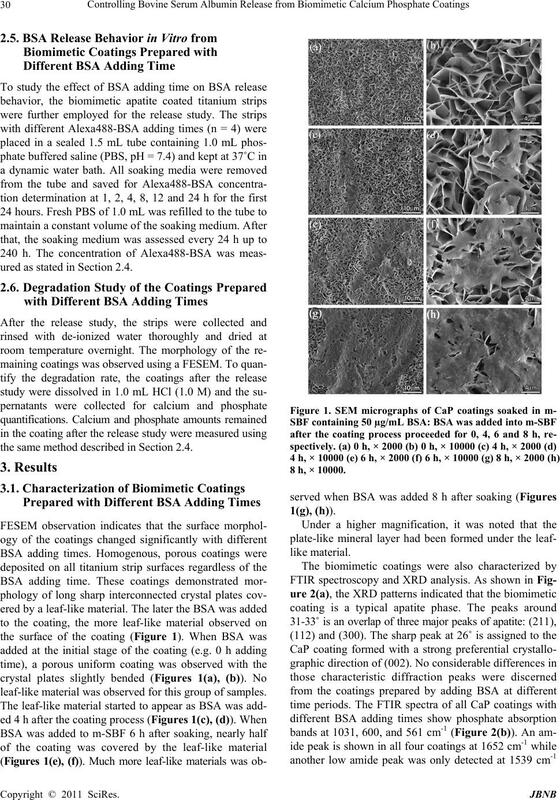 result, the BSA release efficiency could be tailored by adding BSA into m-SBF at different coating formation stages. adjusting its distribution in the coating to achieve a more satisfactory release profile. resulted as the coating slowly degrades in vivo [16,17]. and dried at room temperature. chased and used as a model protein in this study. were then incubated in a water bath at 42˚C for 24 h.
tube, resulting in a final BSA con centration of 50 µg/mL. diffractometer (Bruker AXS D5005) with a copper targ et. and an average scan of 128.
ured as stated in Section 2.4.
the same met hod descri bed in Section 2.4.
leaf-like material was observed for this grou p of samples. 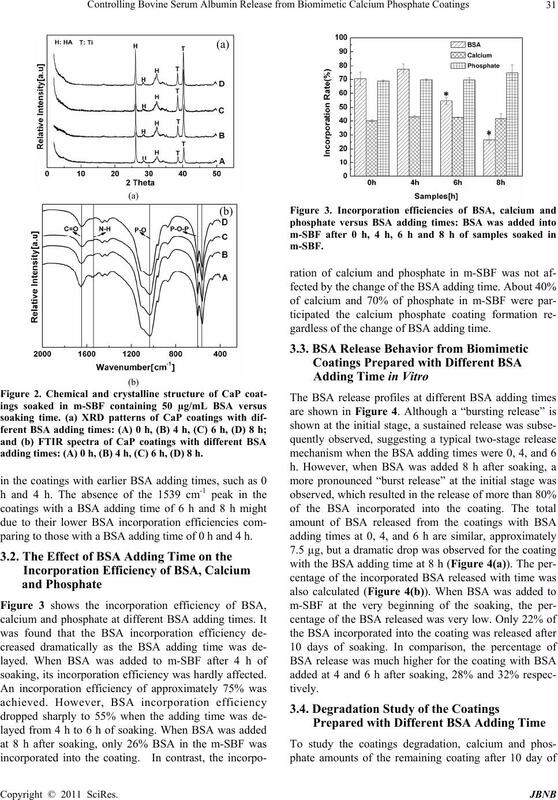 adding times: (A) 0 h, (B) 4 h, (C) 6 h, (D) 8 h.
paring to those with a BSA adding time of 0 h and 4 h.
soaking, its incorporation efficiency was hardly affected. gardless of the change of BSA adding time. phosphate to 25% for both the adding time of 4 and 6 h.
for calcium and 14% for phosphate. 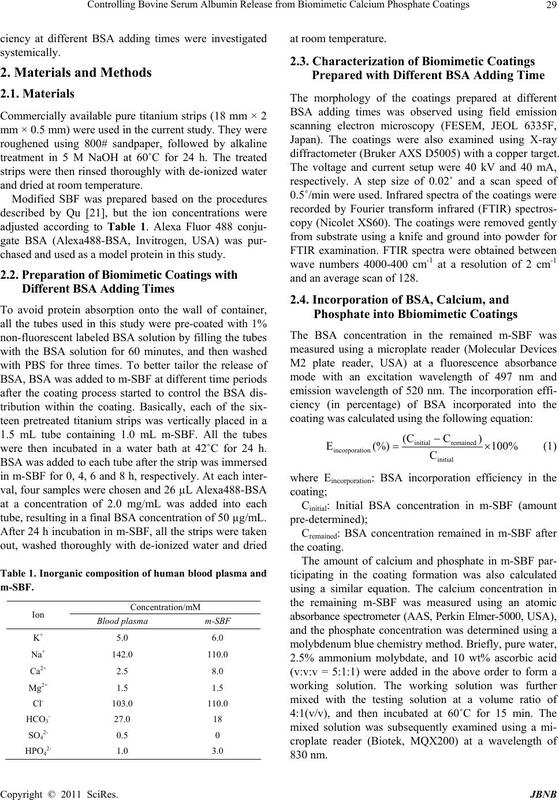 phosphate in coatings before and after the release study. ceeded for 0, 4, 6 and 8 h, respectively. coating process proceeded for 0, 4, 6 and 8 h, respectively. (e) 6 h, × 2000 (f) 6 h, × 5000 (g) 8 h, × 2000 (h) 8 h, × 5000.
proved to be a suitable biomolecule carrier [19,22-24]. porated into CaP coatings in recent years [12,14,25]. 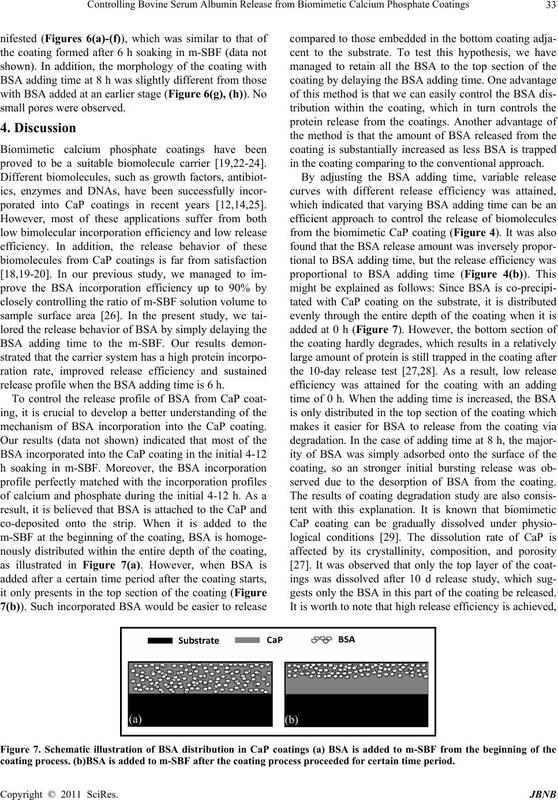 release profile when the BSA adding time is 6 h.
mechanism of BSA incorporation into the CaP coating. in the coating co mparing to the conventional approach. served due to the desorption of BSA from the coating. gests only the BSA in this part of the coating be released. coating process. (b)BSA is added to m-SBF after the coating process proceeded for certain time period. both high incorporation rate and release efficiency. corporation efficiency into/onto the biomimetic coating. and the lower the BSA incorporation efficiency. proteins using biomimetic CaP coatings as a carrier. versity of Connecticut for helpful discussion. Research, Vol. 395, 2002, pp. 81-98. No. 13, 2002, pp. 2623-2629. Vol. 39, No. 4, 1998, pp. 524-530. Biomaterials, Vol. 22, No. 11, 2001, pp. 1425-1431.
for Use as Bone Bonding Implants,” Biomaterials, Vol. 18, No. 17, 1997, pp. 1185-1190. Biomedical Materials Research, Vol. 28, No. 1, 1994, pp. Predicting in Vivo Bone Bioactivity?” Biomaterials, Vol. 27, No. 15, 2006, pp. 2907-2915. Y. Liu, L. Enggist, A. F. Kuffer, D. Buser and E. B.
Vol. 28, No. 16, 2007, pp. 2677-2686. Y. Liu, E. B. Hunziker, N. X. Randall, K. de Groot and P.
Vol. 24, No. 1, 2003, pp. 65-70. 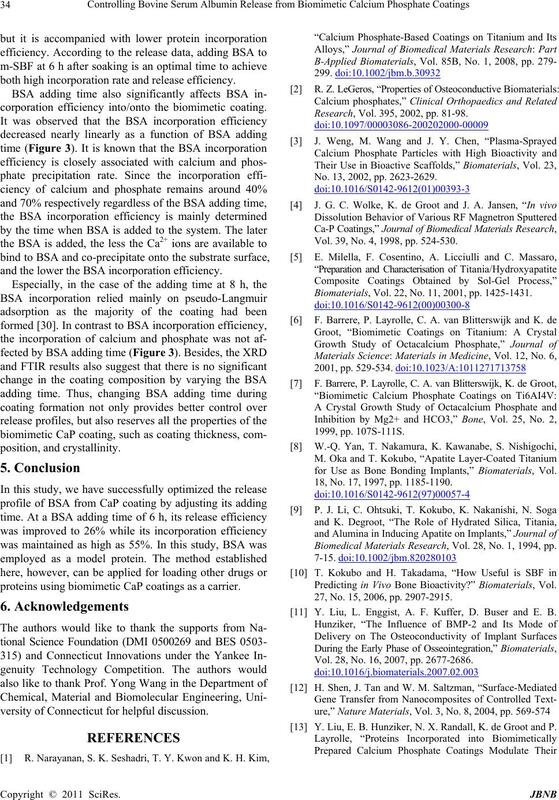 Y. Liu, R. O. Huse, K. de Groot, D. Buser and E. B.
Vol. 86, No. 1, 2007, pp. 84-89. P. Laffargue, P. Fialde s, P. Frayssinet, M. Rtaimate, H. F.
Research, Vol. 49, No. 3, 2000, pp. 415-421. Sciences, Vol. 364, No. 1838, 2006, pp. 233-248. Control Release, Vol. 107, No. 1, 2005, pp. 112-121. 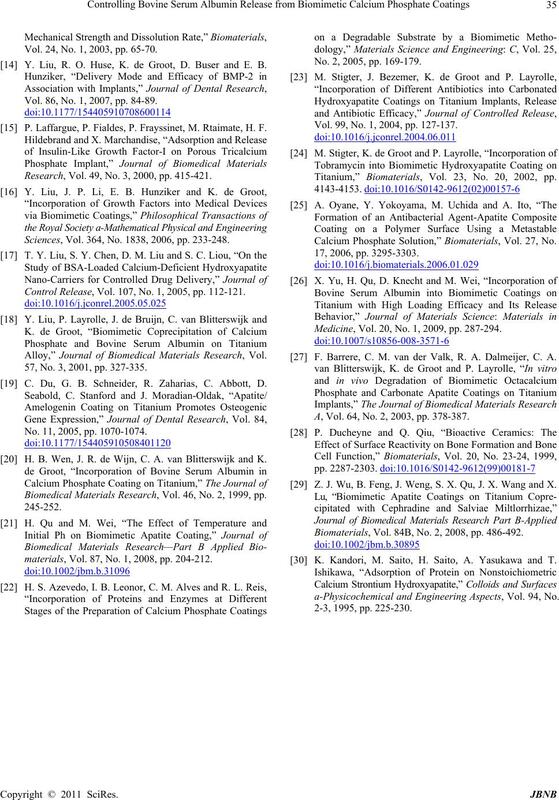 Alloy,” Journal of Biomedical Materials Research, Vol. 57, No. 3, 2001, pp. 327-335. C. Du, G. B. Schneider, R. Zaharias, C. Abbott, D.
No. 11, 2005, pp. 1070-1074. H. B. Wen, J. R. de Wijn, C. A. van Blitterswijk and K.
Biomedical Materials Research, Vol. 46, No. 2, 1999, pp. materials, Vol. 87, No. 1, 2008, pp. 204-212. No. 2, 2005, pp. 169-179. Vol. 99, No. 1, 2004, pp. 127-137. Titanium,” Biomaterials, Vol. 23, No. 20, 2002, pp. 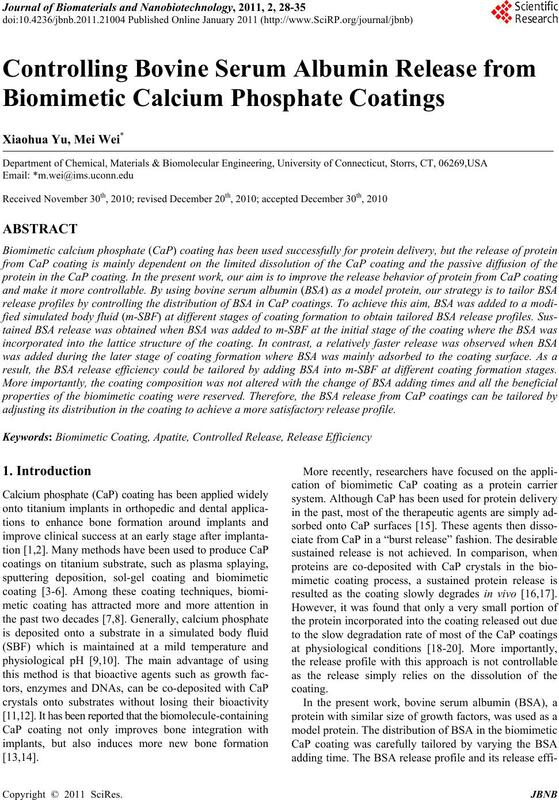 Calcium Phosphate Solution,” Biomaterials, Vol. 27, No. Medicine, Vol. 20, No. 1, 2009, pp. 287-294. F. Barrere, C. M. van der Valk, R. A. Dalmeijer, C. A. A, Vol. 64, No. 2, 2003, pp. 378-387. 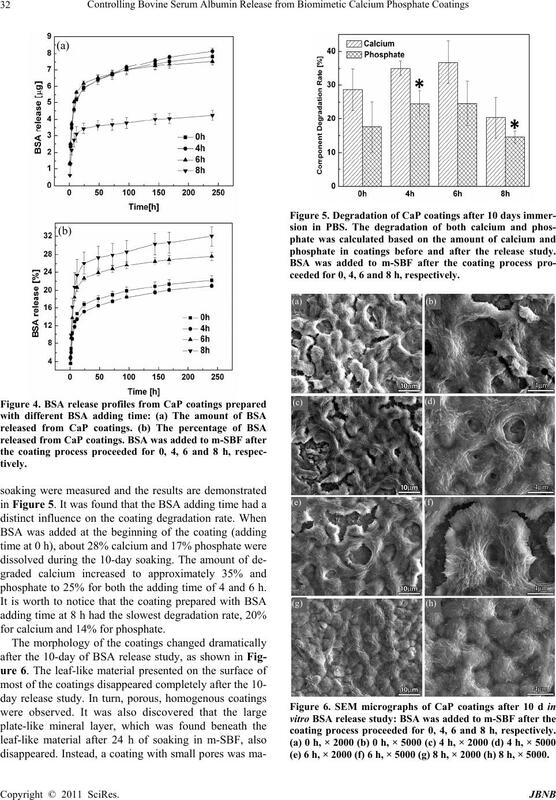 Z. J. Wu, B. Feng, J. Weng, S. X. Qu, J. X. Wang and X.
Biomaterials, Vol. 84B, No. 2, 2008, pp. 486-492. K. Kandori, M. Saito, H. Saito, A. Yasukawa and T.
a-Physicochemical and Engineering Aspects, Vol. 94, No.